A diesel space heater, or radiant heater, is generally classed as an industrial heater. It is powered by fuel and electricity. The fuel creates a flame that heats a large steel plate. This plate therefore heats up and radiates heat from the from of the unit, with the help of an electrically powered fan. 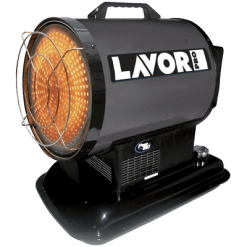 The fuel used by the Lavor range of heaters is either diesel fuel or kerosine, depending on your choice. The heaters are specified by two main terms, BTU and Heating Area. The BTU (British Thermal Unit) is a term used to determine the energy generated by the heater. Therefore, the higher the BTU the greater the heat generated by the heater. The Heating Area is measured in “sqm” (Square Metreage) and is a guide to the area the unit can heat. 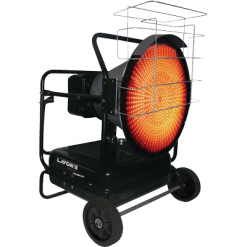 A diesel space heater can be used as a factory heater or warehouse heater.